CREATED WITH Yellow Cab Pizza Co.
About YELLOW CAB PIZZA CO.
A Filipino chain that retails fast food, primarily pizza. “I’m always f***ing hungry.” That’s the fire Anygma had when he started FlipTop. It’s the same fire that keeps the Philippines’ premier rap battle league going strong up to this day. A college senior with no background in business or organizing events, he naturally encountered several challenges. He didn't even know where to begin. From gathering participants, finding a suitable venue, down to the flow of the event, he had to sweat buckets to get everything organized. The story behind the first-ever FlipTop event is a messy one. “I had someone telling me at the last minute: ‘Let’s not do it like this, not do it like that,’” Anygma shares. People were not yet ready for rap events that involve tons of F- and PI-bombs. “There was a backlash from everyone that [wasn't] familiar with or [is] allergic to [the] modern format. A lot of people weren't really supportive as well. They’re telling everyone else [not to] support it, that’s stupid, it’s this and that,” he adds. The Hungry Rapper never looked back and soldiered on. When everyone was critiquing FlipTop for being too harsh and crass, he shrugged it all off and continued to grow the brand. Since then, FlipTop has gained a following of over two million subscribers and almost one billion views on YouTube, making it the most-viewed rap battle league in the world. “I never thought there would be [these] many people on board helping enrich this entire culture,” he says. And no, it isn’t just about throwing around vulgar statements and cussing. “It’s all about creativity. There’s a literary aspect to it,” says Anygma. 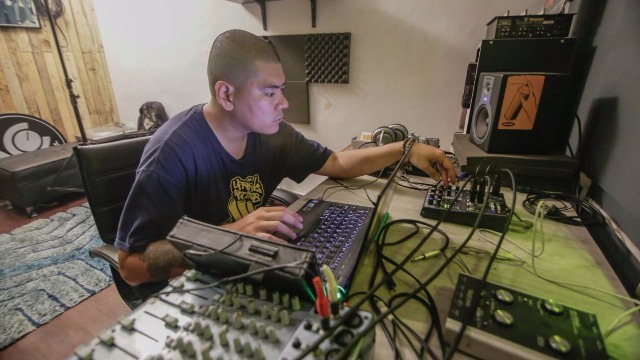 Since it started, FlipTop has created opportunities for many talented local rappers. And while this collective growth fuels Anygma, he remains hungry—for excellence in his craft, and for empowering other artists to find their voices. Aside from organizing FlipTop events, he's also busy managing his own independent music label, Uprising Records Philippines. You can learn a thing or two from Anygma about staying hungry and keeping your eye on the prize. Of course, there will be challenges. But remember: there’s #NoStoppingTheHungry. Check out Yellow Cab's #FuelTheHungry campaign on Facebook for more stories about struggle and finding success. Or you can just order a pizza here. This article was created by Summit Storylabs in partnership with Yellow Cab Pizza Co..